Now first we are going to comment briefly about the topics that we are going to talk in this month podcast. 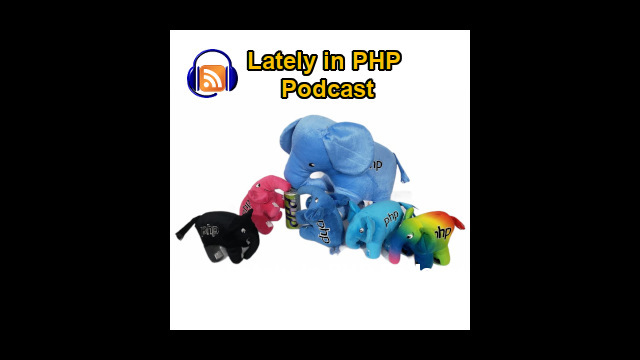 First as usual we comment about the latest PHP versions, latest releases. The PHP 7.2.0 release candidate is already out but it is still has a few release candidates to go. Next we talk about a proposal, a discussion about what happens when we use double values as indexes of arrays. Next we talk about a proposal to have a sort of default values of list assignment when you have an array that you want to assign to different variables you can specify some defaults when the array positions do not have elements. Next we are going to talk about an easy method of overriding built-in PHP functions. This is a good proposal if it would pass of course. Next we are going to talk about this article that talks about the history of unserialize and serialize that is used on PHP. Next we talk about the world elephant day. It is not specific to PHP but since the elephant is the mascott of PHP, this just would be nice to remember. Next we are going to talk about a couple of articles, one about how to create a PHP CAPTCHA solver, using a class that is named PHP OCR that will recognize characters in an image and it will hopefully correct identify them. Not very fancy, it is not even a complete CAPTCHA solution but it would do something interesting. Next we have another article, this time is about implementing a fix for the year 2038 problem that as you know it will affect computers that still rely on 32 bit numbers for referencing dates releated to 1970 January first.